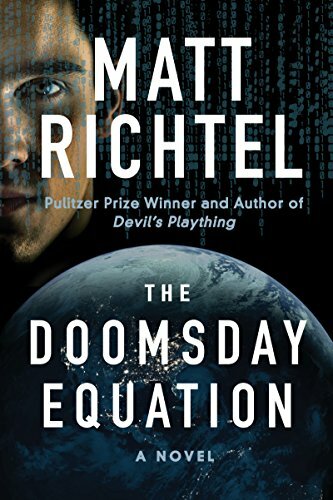 The domains of big data collection, mathematical algorithms, machine intelligence, and human ambition collide magnificently in The Doomsday Equation by Matt Richtel. At its simplest, the multilayered plot gives wunderkind Jeremy Stillwater three days to prevent the outbreak of World War III. Unfortunately, no one believes him given that his sandpaper personality has alienated all his former supporters and fueled his many enemies. That his algorithm can accurately predict global conflicts counts for naught in the eyes of the countervailing operatives in this thriller. Fourteen year olds everywhere will be gleaning smart-aleck tips from this protagonist. Some might even learn something about the downside of provocation. The plausible science that becomes suspense fiction in this book is that Jeremy has joined computer science with historical fact. The big data he crunches and displays on his monitors show what it all leads up to. By analyzing human language around the globe, for instance––the words that nations throw at one another––Jeremy finds a “prism into our collective subconscious,” a map of where we have been and where we are going. Counterintuitively, it is a lull in acrimony––the quiet before the storm––that best heralds the outbreak of war. Predictably, a business partner tries to take charge of Jeremy’s invention, convinced that the world of commerce is far more important than Jeremy’s naïve wish for global peace. A subroutine named after Gavril Princip, the Serbian national who shot Archduke Ferdinand and thus set off World War I, calculates the prime mover of World War III. It shows the igniter to be none other than Stillwater himself. The revelation pits him against a cadre of guardians who come from every ethnic, demographic, and religious group on earth—all working for a common purpose, which is to bring the earth to annihilation. A small complaint is that Richtel wraps up matters too tidily at the end. Granted, clues to the identity of the ultimate villain are planted early on, but it is somehow disappointing that the obvious villain in fact turns out to be the actual villain. More camouflage is wanted. To be fair, the book’s plot is complicated, and the polyphonic lines of narrative weave agreeably. It’s a bit of a logical stretch to think that an iPad has sufficient horsepower to connect with and remotely control a supercomputer. But nobody said fiction has to make sense. It has only to entertain. And this book does so in spades.